Adventist Stewardship | Why Should Our Offerings Be Percentage-Based? Why Should Our Offerings Be Percentage-Based? How do I determine how much I will give when I give an offering? Is it my decision based on biblical, established criteria, or do I depend only on my immediate emotional response or my personal feelings at the moment of giving? In fact, what criteria do I use to to decide whether I should give an offering at all? Are offerings as binding as tithe, or do they belong to a less important category? Must I give an offering every time I tithe, or am I free to decide the frequency “according to my heart”? What should legitimately prompt my giving? A good project, an urgent need in my local church, a deep spiritual emotion raised by a mystical experience, or none of the above? 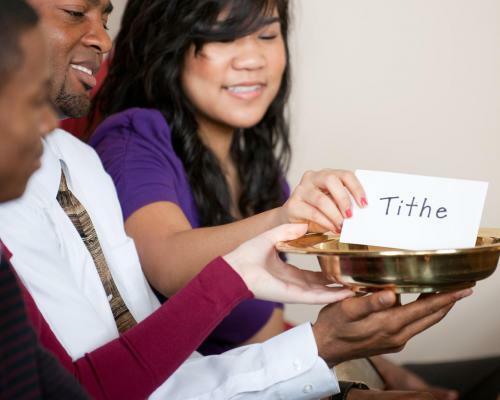 WHICH IS MORE IMPORTANT: TITHE OR OFFERINGS? Surprising as it may be, and different to what some assume to be the popular Adventist belief about tithe and offerings, the Bible teaches that even though they have different purposes, both are an essential part of our worship and faithfulness to the Lord and both should stand at the same level of importance to the worshiper. They are both required by the Lord and not bringing them to Him is considered by the Lord to be a lack of honesty (Mal. 3:8, 9). Nevertheless, even though they are equally important, they should not be mingled or interchanged by the worshiper because each has specific functions in God’s masterplan for the finishing of His work. Tithe should never be delivered as an offering or vice-versa. WHAT KIND OF CIRCUMSTANCE SHOULD PROMPT AN OFFERING? HOW FREQUENTLY SHOULD IT BE GIVEN? Owing to our sinful nature, it is unsafe to establish the regularity or even the amount of our offerings based merely on feelings,good intentions, spontaneous gratitude of the heart or even appeals for relevant missionary projects. We are, therefore, called to bring our offerings based on principle, and out of a definite purpose of the heart, according Paul (2 Cor. 9:7). Even if we do not have the right spirit, if there are no feelings in that regard or if we are unaware of any relevant project, we should not fail to recognize God’s blessings in our life by worshiping Him with the “firstfruits of all your increase” (Prov. 3:9), asking Him, at the same time, to give us the right spirit to truly worship Him (Ps. 51:10) according to His will. This means that, in the same manner as tithe, offerings are expected by the Word of God to be presented to Him every time there is an income or increase (Prov. 3:9), recognizing that He is the source of every increase or blessing. Failing to regularly bring offerings every time we tithe (or when there is an income or increase), may represent a rejection of God as the Provider of all blessings, and is part of what is identified as dishonesty in His Word (Mal. 3:8, 9). HOW MUCH SHOULD I GIVE AS OFFERING? Unlike tithe, whose amount is clearly established by the Lord (10 percent), the amount to be given as offerings was left by God to the worshiper to decide, to purpose, according to the gratitude of heart (2 Cor. 9:7). This means that there must be a personal decision, and if I do not decide the amount beforehand, I will be left to the control of the changing inclinations of my sinful heart. Should that purpose, nevertheless, be based on a specific amount or rather on a proportion of my income, as it is in the case of the tithe? Why not give regular offerings based on an amount? To promise a specific amount as offering may be unfair or even unwise, as it is possible that our financial situation may significantly change after the specific amount had been so purposed, making it unreasonable or even impossible to fulfil the promise. For example, if the income (blessing) increases significantly, the purposed offering may become insignificant compared to the income and may no longer reflect the appropriate level of gratefulness. On the other hand, if there is a significant decrease or even a cessation of income because of unemployment or other reasons, the offering promised may no longer be sustainable. That is why it seems wiser that every believer, even those without any regular income, should make a percentage-based decision instead of an amount-based one. This percentage-based decision, which we call our Promise, should be based not on the expectation of blessings yet to be received, but on a deep sense of trust and gratitude for blessings already received. This was Jonah’s motivation when he sang after his deliverance: “But I will sacrifice to You with the voice of thanksgiving; I will pay what I have vowed. Salvation is of the Lord” (Jonah 2:9). CAN WE FIND THE PROPORTIONAL APPROACH TO NON-TITHE GIVING IN THE BIBLE? Even though it is not too explicitly stated, it seems that the Bible implicitly favors a proportional, or percentage-based, approach as a better way to demonstrate our thankfulness, generosity, and liberality even in respect to non-tithe initiatives. Here follows some indications of the proportional approach. THE STORY OF ZACCHAEUS is one example in the New Testament where, wise accountant as he was, Zacchaeus did not propose to return a determined amount to the poor, but a specific percentage of his goods (“half” or 50 percent). He also decided to restore fourfold to the ones he had taken something from dishonestly (Lk. 19:8, 9). The principle of tithing probably trained many Jews like Zacchaeus to think in a proportional way, which requires a slightly more elaborate logic than the “fixed amount” approach. ANANIAS AND SAPPHIRA were not condemned for failing to bring an offering. They did bring a determined amount, and it was probably not small. The problem was that they “kept back part of the proceeds . . . and brought a certain part and laid it at the apostles’ feet” (Acts 5:2). If it is true that the word “part” may also describe a proportion of a total, then the reason that caused not only their death but also their eternal loss seems to be related to the delivery of a different proportion than the one promised. We may find another hint, still in the NEW TESTAMENT, in 1 Corinthians 16:2, where Paul indicates that the contribution must be “as he may prosper” (NKJV) or “in keeping with your income” (NIV)—an indication that God expects more of those who receive more and less from those who receive less—thus suggesting a proportional approach. In the OLD TESTAMENT, the proportional approach was apparently also chosen by “some of the heads” in Ezra’s time (Ezra 2:68, 69), who “offered freely for the house of God, to erect it in its place: According to their ability, they gave to the treasury for the work” (italics supplied). In Deuteronomy 16, Moses says that the offering shall be given “as the Lord your God blesses you” (verse 10) or “as he is able, according to the blessing of the Lord your God which he has given you” (verse 17). In the two verses, the text may express both ideas, of regularity and proportionality, which indicates that God expects offerings every time there is a blessing (an income or increase), and that they should be given following a proportional pattern. AND WHAT IF I DO NOT HAVE AN INCOME? Paul also indicates that the Lord doesn’t expect anything, not even tithe, from those who have the purpose to give but have not received anything from Him: “For if there is first a willing mind, it is accepted according to what one has, and not according to what he does not have” (2 Cor. 8:12). After all, if I have no income, how much is 10 percent of nothing? In this way, God is reminding us that He is ever the One who gives first. We can never give more than what we receive. Also, this proportional concept, by itself, counters the idea of prosperity theology. Through the proportional approach (percentage-based), we will give because we have already received. Instead of giving to receive, we will be forced to look back to the blessing already received (income) in order to calculate the amount to be given. It is ever the perception of blessing that should prompt our giving of either tithe or offerings (Prov. 3:9). WHAT DOES “SYSTEMATIC” REFER TO IN “SYSTEMATIC BENEVOLENCE” IN ELLEN G. WHITE’S WRITINGS? What is clear so far is that under that system, offerings are not estimated by God according to the amount given. One may be giving a large amount, but if it is not given under the right system, it may not be estimated! We may remember at this point that even though both, Cain and Abel, were actually presenting an offering, only the one that was given under the right system was accepted. It is interesting to note that the discussion about an appropriate offering system was the subject that generated the first murder (Gen. 4:1-8)! This matter seems to be so important, that Ellen G. White comes to the point of specifying that “it was by the Lord Jesus Christ Himself, who gave His life for the world, that this plan for systematic giving was devised.” Yes, there is a plan, and there is a system. Interestingly enough, in line with Malachi 3:8, the text conveys the idea that, to give offerings is something as obligatory as to return the tithe, and the reason is that both are part of the same system! (Even though the word obligatory is far from being popular, it is there!) The text also says that both should be given in a regular and systematic way. As those words are not synonyms, we must now raise two important questions. First, what defines the regularity? And second, what is that system or how does it work? We may find a hint at answers to both questions in another quotation: “In the Bible system of tithes and offerings the amounts paid by different persons will of course vary greatly, since they are proportioned to the income….” This enlightening declaration assumes that  there is a system (singular), that  tithes and regular offerings are under that same system, and that  both (“they”), tithes and regular offerings, should be given as a determined percentage or proportion of the income. Some may wonder why we use the words proportion and percentage in an interchangeable way, while Ellen G. White only uses the word “proportion”. The answer is that as percentage is a way to express proportions, and that every proportion can be mathematically expressed by a percentage, it makes no difference whether we say one tenth (proportion) or ten percent (percentage) of something. The result will be exactly the same. WHAT FREQUENCY DEFINES THE “REGULARITY”, AND WHAT “SYSTEM” IS BEING REFERRED TO? Based on what we have seen on the paragraphs above, we may answer these two questions about regularity and the system by saying that the regularity of both tithes and offerings, should be determined by the timing of the income, and that the system includes the idea that tithes and offerings should be calculated as a proportion, or percentage, of the income. HOW DO I CALCULATE MY OFFERINGS? Would it not be too dry, legalistic or formal to give offerings in this way? We may understand it better if we ask the same question for the tithe, as both are under the same system. Should I not give tithe when I have not the right spirit? My marriage helped me to understand this matter, as I am also obliged to stay married to the same wife all my life! Would that not also be considered too dry and legalistic? Not, of course! Even though my heart is unworthy of trust and my affections prone to change frequently, I have learned that in order to love my wife, I must first choose it, and then pray for it, recognizing that nothing good, not even to love her properly, or giving offerings to God in a right spirit, or anything good, can come, unassisted by God, or without a previous decision, out of my fallen heart. Even though the Bible or the Spirit of Prophecy don’t speak against project-driven offerings, regular offerings, given under the system of a percentage of one’s income, should be the first and most basic way of giving. In this way, any other kind of project-driven offering should be given in addition to it. In a very interesting text, Ellen G. White says that “a conscientious few [of the Israelites] made returns to God of about one third of all their income [about 33 percent, including tithe and regular offerings],” and then she adds that “besides all these systematic and regular donations there were special objects calling for freewill offerings [project giving? ], such as the tabernacle built in the wilderness and the temple erected at Jerusalem.” It seems obvious, at least in this passage, that there is a clear difference between (1) systematic and regular donations and what she calls (2) freewill offerings, this last one being designed to attend to sporadic project necessities. Considering all that has been said, is there yet any way that I may exert my free will when giving regular and systematic offerings? I have been granted the free will to accept or reject Jesus Christ as my Savior, and His Word as the rule of my faith. But once I have accepted His word as the guide to my thoughts and actions, the act of tithing and giving regular, percentage-based offerings, is no longer optional. Both, being under the same system, are expected to be returned or given after any income is received, and are an important part of the Adventist Christian personal communion package: daily Bible study, frequent prayer, studying the Adult Sabbath School Bible Study Guide, attending Sabbath School, and opening and closing the Sabbath at sunset. One of the differences between tithe and offerings is that God specifies the percentage for tithe, while for the offerings, He gives me the freedom to decide what that percentage will be, according to my recognition of His blessings. At some point of the Christian life, there must be a decision; a purpose of the heart must be made in regard to that percentage. I have already made my decidion¾ more than forty years ago now¾and my family and I have seen amazing blessings as a result of it. What about you? How about now? Ellen G White, Counsels on Stewardship, p. 199. “[On giving] Christians should act from fixed principle, following the Savior’s example of self-denial and self-sacrifice” (Ellen G. White, Counsels on Stewardship, p. 25). Unless otherwise indicated, all Bible texts in this article are taken from the New King James Version. Copyright ã 1979, 1980, 1982 by Thomas Nelson, Inc. Used by permission. All rights reserved. Translated as “Pacto”, in Spanish and Portuguese, it’s a system of giving in which someone decides to worship God regularly and systematically by returning after any income, (1) God’s holy tithe and by (2) giving a pre-determined percentage of any income as an offering. It’s an exercise of faith and gratitude which leads to a deeper trust in Him and to a greater dependency on Him. (You may find more about Promise here: https://stewardship.adventist.org/promise-offerings). Ellen G. White, The Acts of the Apostles, p. 342 (emphasis provided). Texts credited to the NIV are from the Holy Bible, New International Version. Copyright ã 1973, 1978, 1984, 2011 by Biblica, Inc. Used by permission. All rights reserved worldwide. Ellen G White, Counsels on Stewardship, p. 180 (emphasis provided). “The Lord gave Cain and Abel directions regarding the sacrifice they should bring Him…. [Cain] was not willing to be dependent on Abel for an offering. He would not go to him for a lamb…. Abel interceded with his brother, repeating to him the very words of God’s command to them both regarding the offerings He required. Cain was provoked because his younger brother should presume to teach him… By this history the Lord would teach everybody that His Word is to be implicitly obeyed. Cain and Abel represent two classes – the wicked and the righteous, those who follow their own way and those who conscientiously keep the way of the Lord….” Ellen G. White, Manuscript 136, 1899. Ibid., pp. 80, 81. (emphasis provided). Ibid., p. 73. (emphasis provided). Ibid., pp. 80, 81 (emphasis supplied). Ellen G White, Testimony Treasures, vol. 1, pp. 546, 547 (emphasis provided). Even though Ellen White may use the designation “freewill offerings” in many other different ways in her writings. Dr. Robert McIver, in his book, calls them “practices of personal piety,” and statistically demonstrates that all those practices are correlated to tithing. (He does not include percentage-based offerings in his research.) See McIver, R. (2016), Tithing Practices Among Seventh-day Adventists: A study of tithe demographics and motives in Australia, Brazil, England, Kenya and the United States (Cooranbong, NSW, and Silver Spring, Md. : Avondale Academic Press and Office of Archives, Statistics and Research—General Conference of Seventh-day Adventists), p. 153.